This was one of those nights when we wanted something fun, but didn’t want to work too hard for it. 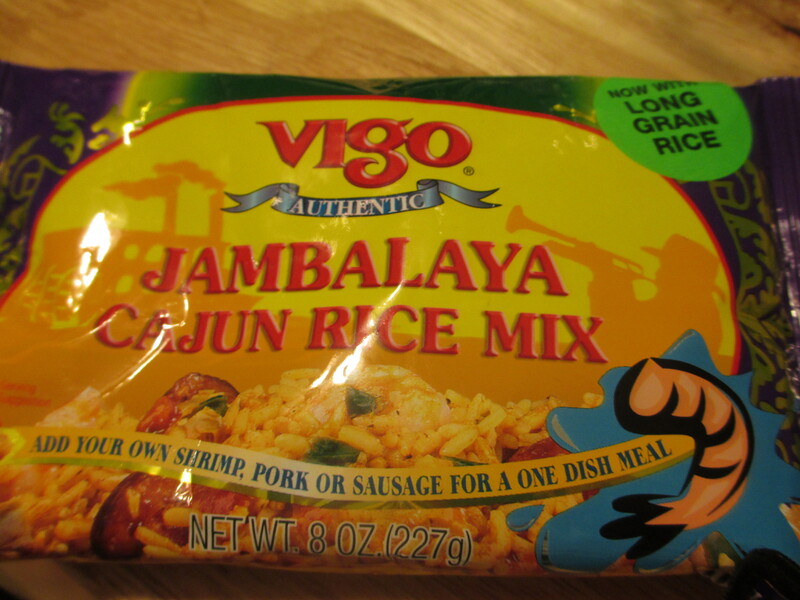 This Vigo Jambalaya rice mix was an easy base for our next ingredient. Brent made that while I prepared the rest. 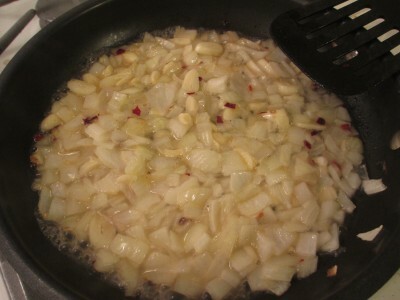 I diced an onion and sauteed it in Earth Balance buttery spread, chardonnay, flake red pepper and garlic. We’re using a different kind of vegan shrimp than our usual Ocean’s Best. Visually it was a decent substitute for shrimp. This particular variety is soy and gluten free and has the texture of overcooked shrimp. I don’t mind that chewier texture, in most dishes I prefer it. It gave a good contrast to the tender rice and soft onion. At this point I’m neutral to the two. Sophie’s has a slightly better nutritional profile because they’re made with konjac flour instead of potato starch like Ocean’s best. In the end, they’re both tasty, very processed, taste not unlike the real thing but won’t convince most picky carnists. I’d get them if you’re really missing shrimp. Real shrimp are harvested by ocean dredging which is the ecological equivalent of clear cutting a forest. These are better for your conscience. If you get to try them, let me know what you think!